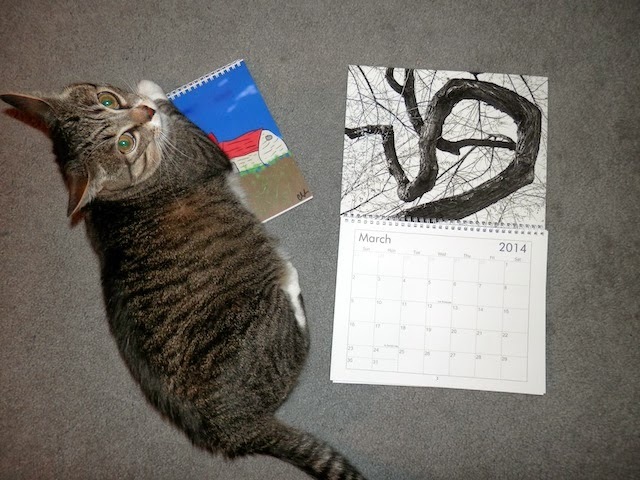 I didn't think I would be able to do a calendar this year but last week I decide I had the funds to make one. I uploaded my photos and placed my order with VistaPrint.Com last week. I wasn't expecting them to arrive until next week but they were delivered yesterday! They look great! Twenty Thirteen was quite a year for me. In March I bought an electronic piano that was on sale. I've been enjoying it quite a bit but I haven't done much practicing since I moved. I created 2 photo books from the photos I took on the motorcycle trips I've taken. They turned out very well. I want to make another one of general photos I've taken but am looking for a more affordable printing option. I had my first art show this year. I displayed 16 of my better photos at a local sandwich shop last February. I don't have any immediate plans for another show. The rents started going up in Denver last year and this year they simply priced me out of the apartment. I couldn't afford to rent in Denver anymore. I calculated I could pay a mortgage, insurance, utilities, and other fees for less than I was paying in rent, so I bought a small townhouse in Arvada Colorado. I'm no longer in Denver. It is much, much quieter here; I don't have fire trucks, ambulances, and cop cars racing past at all hours of the day and night. I do miss the quick access to the Denver parks. In late May I took a day trip to Scottsbluff to visit the Scott's Bluff National Monument. It was a fun ride except for the tornado. I went to the Sturgis bike rally for the first, and only, time this year. Sturgis was a major disappointment but it was a beautiful ride there and back. I had a heart attack on June 5th at 1:35pm. It was not the grip your chest and scream type, instead I developed strong pain in both arms from my shoulder to my elbow and pain in both jaws. I tried shaking it off. I started making a pot of coffee thinking that would make me feel better, but before the coffee had finished brewing I realized it was serious and got help. The fire department arrived within 2 minutes followed immediately by the ambulance, and 10 minutes later I was in the emergency room. They were actually standing by waiting for me. Five minutes later I was in surgery ( the cath lab.) They installed a stint into my Left Anterior Descending. I had little or no damage and they kept telling me how lucky I was to react and get in so quickly. I don't want to think about how things would have turned out if I was on the road. Cardiac rehab was just walking on a treadmill or stationary bike while they monitored my heart. I bought my own treadmill after I finished rehab. I prefer to walk outdoors but I don't like walking on concreate or in the cold. That's what the treadmill is for. I haven't had a cat since 1980 and I've really missed having one. Pets weren't allowed in the apartment but now I have my own place so I adopted a cat from the shelter. We get along fine. I wasn't affected by the biblical flood of 2013. There was flooding in north east Denver, all along the Platte river from Commerce City into Nebraska, and in Boulder, Longmont, Loveland, Fort Collins, Estes Park, and Lions. Those are all places where rivers and streams come down out of the mountains. Greeley got flooded by the Platte. The farmers along the streams and the Platte lost everything. I am very fortunate to be alive, have my own home, am warm and dry, and have food on the table. This year was quite a year for me but it has still been a good year. Happy New Year Clive! Wishing you all the best for 2014. Thanks Nick! Happy 2014 to you too. Have a great new year.